Welcome to a special weekend edition of FiveThirtyEight’s weekly politics chat. The transcript below has been lightly edited. micah (Micah Cohen, managing editor): Hey, everyone! We’ve convened here on a weekend(!) to talk about President Trump’s address to the nation on Saturday. Trump called the country together to make an offer to Democrats to try to end the partial government shutdown, now more than 28 days old. So, the question in front of us: Is this offer likely to end the shutdown? 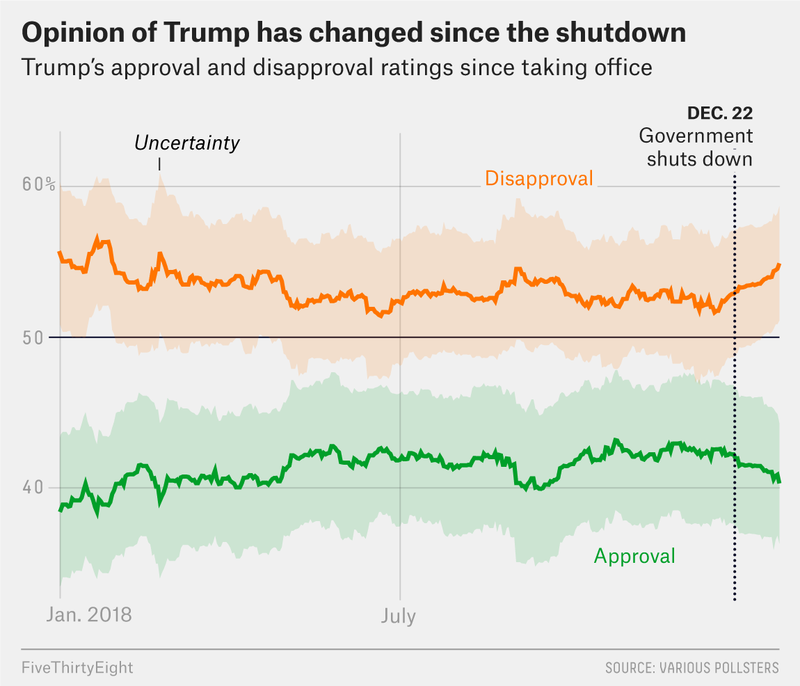 And, more generally, is this a smart move politically by Trump, who’s seen his job approval rating erode as the shutdown has dragged on? Let’s briefly start with that first question. What do you make of Trump’s offer? Will it bring about the end of the shutdown? perry (Perry Bacon Jr., senior writer): It’s not at all likely to end the shutdown. House Speaker Nancy Pelosi bashed the proposal before the speech started (once reports came out with Trump’s offer). He didn’t consult Democrats before the proposal was released. It’s not clear he was even really trying to get Democrats to sign onto this. sarahf: Yeah, what I don’t understand about the proposal is that it was negotiated without any Democratic input. It was just Vice President Mike Pence, Senior Adviser Jared Kushner and Senate Majority Leader Mitch McConnell talking with fellow Republicans. natesilver: I mean, there are some permutations where this is the beginning of the end of the shutdown, I suppose. Those have to involve some combination of (i) Trump offering a better deal than what he’s offering right now, and (ii) public opinion shifting to put more pressure on Democrats. perry: I think that’s the only way to look at this. natesilver: The real audience for the speech is likely the media. Because we’re the only people sick enough to actually waste our Saturdays watching this thing. slackbot: I’m sorry you aren’t feeling well. There is Advil, Aleve and Tylenol in the cabinet in front of Nate’s office/Vanessa’s desk. Anyway, in theory, “we’re willing to compromise and Democrats aren’t” is a perfectly decent message. It’s BS in various ways (mostly because the compromise Trump is offering isn’t too good). But it’s a fairly conventional message — to sell a not-very-great compromise as being a good deal. sarahf: Right now, Americans overwhelmingly continue to blame Trump and congressional Republicans for the shutdown. Saturday’s speech seemed like an attempt on his part to try and shift some of that narrative by outlining a proposal that definitely seemed like a compromise. perry: And I think it has as few potential good effects for Trump. First, it may help keep Republicans on Capitol Hill aligned with him. They were getting leery of his wall-only strategy. This makes it easier for the party to unify around him. Second, Trump’s proposal allows McConnell to hold a vote and suggest he and his chamber are trying to resolve the shutdown too, just like the House is doing. Finally, I assume, when pollsters ask people about this proposal, it will be more popular than the wall itself. My guess is it will be near 50 percent support and perhaps higher. Most people I assume aren’t totally against any money for the wall and feel like Dreamers must have a path to citizenship or else. sarahf: And I don’t know if it’s a good look for Democratic leaders like Pelosi to immediately come out the gate saying, “nope this doesn’t work.” Then again, they weren’t consulted in the making of the deal it sounds like, so maybe she’d be better off highlighting that. natesilver: I did think it was weird that Trump opened the address with a sort of uncharacteristically gentle paean to the virtues of legal immigration, but then careened to talking about drugs and gangs and violence and some of the other stuff that doesn’t usually pass a fact check. If you actually wanted to portray an image of bipartisanship, you could skip most of that stuff. Or you could talk about how there were extremists on both sides — call out Republicans for X and Y reason. I do wonder if this could change the politics of the shutdown in more than one way, as Perry was getting at. It could make Democrats look like the intransigent side, as you were all saying. But, it could also shift the narrative towards more “border crisis” and less “wall.” And that’s better political ground for Trump. 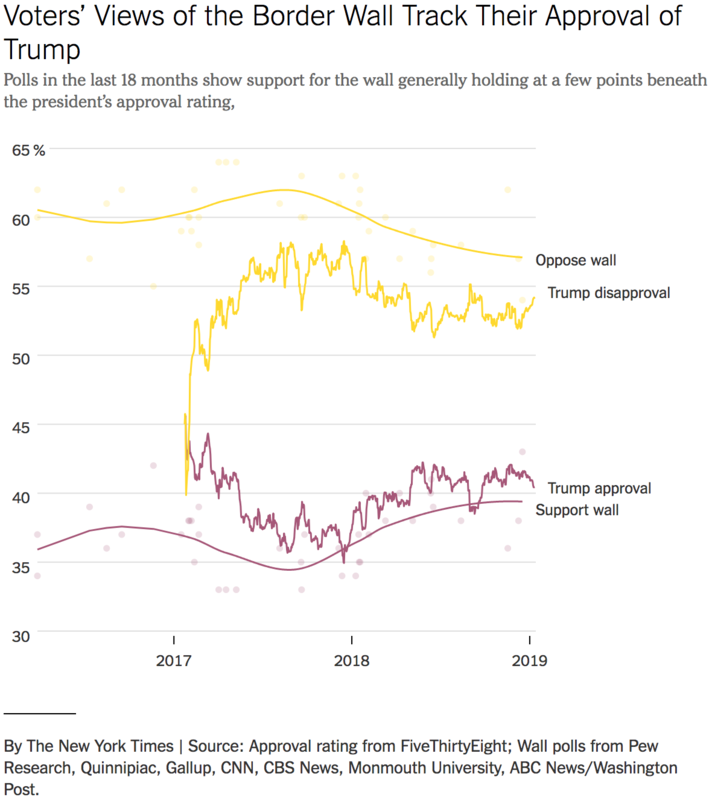 Polls show more people believe there is a crisis at the border than support a wall. natesilver: It could shift things — although, again, it’s worth mentioning that the deal Trump offered isn’t really much of a deal at all. In fact, it offers a bit less than what they floated last night. The DACA part itself is a compromise, but to get that compromise, Democrats have to give up something (wall funding) that they’re firmly opposed to. Although, it probably is fair to say that the wall is also a compromise of sorts. As Trump actually emphasized. It’s not all that much wall. It’s certainly not a big concrete wall stretching the length of the border. sarahf: I know! OMG, what a 180 from him on that! And, as Democrats will be quick to point out, they were already working on their own legislation that would give $1 billion in funding for border security (but not a wall – to be clear). natesilver: Right, and Trump hasn’t really made the case as to why a wall is necessary to stop the humanitarian crisis at the border. The other thing is that … none of this is really new. This compromise, if you want to call it that, has been around for a long time. Democrats have rejected it because it doesn’t give them enough. They rejected better versions of this compromise before the shutdown began, in fact. And Democrats have more leverage now than then because Trump needs the shutdown to end a lot more than they do — it’s hurting him politically. micah: I guess my point is more that the convo may change. perry: To put this bluntly, I think this speech had two audiences the media (so they will do “both sides” coverage) and Republicans (so they will stay loyal to Trump on this issue). I assume this speech will buy him at least of few days of that. And both of those, as Micah suggests, will help with the public opinion. sarahf: I was kind of surprised that he made no mention of the thousands of furloughed government workers. Like some kind of nod to their hardship. But nada. I’m joking, but that is what he thinks. natesilver: The question is partly: will the press run with Trump’s frame? perry: Trump may have bought himself at least another week to sustain this shutdown. Next week will be 1. Pelosi rejected Trump’s idea before he spoke, and 2. Senate holds vote and Democrats filibuster. micah: I think that’s right, Perry. natesilver: There’s at least some semi-intelligent understanding on the White House’s part of how media dynamics work. natesilver: But the thing about that NBC headline is that the “new” part is pretty misleading. micah: Yeah, at least in the very very early going, this seems like a good move by Trump. natesilver: Keep in mind that media might feel a little chastened this week by the mess that’s become of the BuzzFeed story. micah: Yeah, I was thinking that. perry: I also think that keeping the Lindsey Graham’s of the world happy is something Trump cares about. The Republicans on the Sunday shows now have something to say. So do the Will Hurd’s. perry: Pelosi and Democrats, I would argue, were more unified than Republicans before this speech. But I wonder if some moderate Democrats start getting nervous now. 3. Trump offers Democrats a little bit — maybe quite a bit — more. If all of that happens, maybe he gets a deal! And no one of those steps is *that* crazy. perry: So the fundamentals of this issue have not changed, you are saying, Nate? natesilver: I don’t really think it changed anything. natesilver: Except Trump made a chess move to advance the game instead of just sitting there petulantly staring at his opponent and watching his clock run down. micah: “It gives him some more time” is a good read, I think. natesilver: It was an extremely standard chess move, but at least it was a move! sarahf: Well, I mean leading up to this speech there had been some speculation he’d declare a national emergency. And he didn’t do that. So all things considered, I think this was a much smarter political move to make. natesilver: Oh yeah, this is definitely better than that. natesilver: It was, like, almost what a normal president with a competent group of advisors would do! natesilver: But it will require a lot of follow through. perry: I think Trump is aware that declaring a national emergency is a “loss.” He doesn’t want a “loss.” I don’t know how he gets a win. I actually think, this proposal, if it was passed, would very much irritate the right. I will be curious how the right receives this idea. perry: Ann Coulter attacked it hard. natesilver: Coulter attacked it … although… you could almost say that’s helpful for Trump. It makes it seem like more of a compromise if the right hates it. natesilver: Now, if he loses the votes from several conservative Republicans in the Senate, then he’s screwed. Or if he himself has second thoughts because Sean Hannity calls him tonight, he could screw himself. perry: That’s an interesting question: Can Sen. Ted Cruz vote for this? Can it actually pass the Senate? perry: Because I assume part of the play here is for Republicans in the Senate to be seen doing something about the shutdown. Would Sens. Susan Collins and Cory Gardner support this from the left-wing of the GOP? I think yes. But would Cruz, and some of the more hard-core immigration members on the more conservative wing of the party? I assume yes, but I’m not sure. micah: Wouldn’t you assume he cleared this with the Cruz’s of the world before unveiling it? perry: I would not at all assume that. sarahf: Yeah, I’m not picturing mass Republican defections here in the Senate … I guess just because McConnell seems to have been so heavily involved in negotiating this. perry: Do we think any Democrats vote for it? He voted to confirm Supreme Court Justice Brett Kavanaugh, so it’s not exactly like he’s worried about stoking the ire of the Democratic base. sarahf: But it does make you wonder why Trump ever listened to Mark Meadows and the Freedom Caucus in the first place getting into this mess. Wouldn’t have $1.7 billion or whatever it was and no extension for DACA, TPS, etc. have been more popular for them? I guess none of it went to the wall. So maybe not. No way to appease anyone! natesilver: Right, the $1.7 billion didn’t specifically include border wall funding though. perry: Another question: I think I’m a believer in the distraction theory, so would Trump have scheduled this speech if he knew Buzzfeed’s Michael Cohen story would be so heavily criticized? micah: He sorta stepped on a pretty good news cycle for him. Though Buzzfeed is standing by its reporting. natesilver: Hmm. But the fact that he had a good news cycle probably means that today will be portrayed more favorably by the press. So that gave him more incentive to do it. perry: So you think the media, cowed by the coverage of the Cohen story, will cover this announcement more favorably than otherwise? micah: And you think the former is more accurate than the latter? natesilver: I think “Trump again proposes already-rejected compromise in competent speech; Pelosi reiterates that she won’t agree” is roughly correct. I guess what I’m saying is that it wouldn’t be too surprising if the politics of this improved for Trump after his speech, given where they are now. There’s plenty of room to improve. perry: We know that presidential addresses generally don’t work. But Trump is making those political scientists look really smart. sarahf: I think the fact that Trump didn’t consult Democratic leadership is a big ding against this proposal. But the fact that Trump did put forward some kind of compromise is something. It has the potential to change the politics around the shutdown. It’ll be interesting to see what congressional Republicans actually put forward and what Democrats choose to counter with. natesilver: I thought it was a bit weird at the end when Trump said this was just the start of negotiations on a much bigger immigration solution. If this is just small potatoes stuff, Pelosi might ask, why do we need to keep the government shut down, when we’re going to have a much bigger discussion about immigration anyway? That’s ultimately the question that Trump doesn’t really have a good answer for. Why do we need to keep the government shut down to have this negotiation? Senate Minority Leader Chuck Schumer and Pelosi will need to be clear about that in their own messaging. At the same … I wonder if they also want to float, maybe on background because it does sort of contradict the message of “no negotiations at all while there’s a shutdown,” some notion of what a real compromise would look like. e.g. the full DREAM Act. Or my idea: Offer HR1, the Democrats’ election reform/voting rights bill, in exchange for the border wall. perry: The one reason I have a hard time seeing any deal being cut: “the wall is a monument to racism” is a real view on the left and has real influence. That makes it much harder Democrats to sign off on any money for the wall. natesilver: Also, Republicans would presumably never agree to HR 1. But it moves the Overton Window (sorry if that’s become an overused concept now) and frames the idea that Republicans are nowhere near offering a fair compromise. If the wall is so important to Trump — and he’s often talked about it as his signature priority — a fair offer now that we have bipartisan control of government would be to give Democrats what’s literally their No. 1 priority (given that they named the bill HR1) as well. micah: Yeah, that kind of deal seems a looooooong ways off.